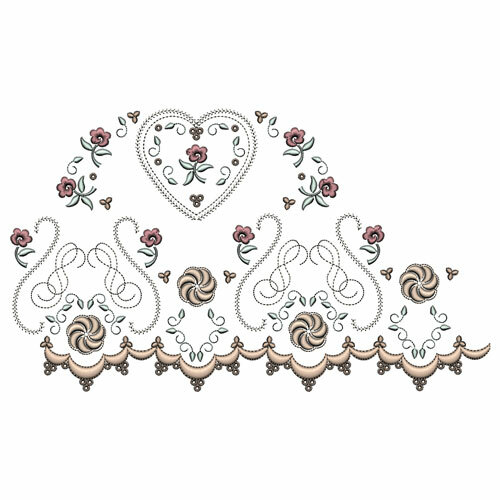 You surf the internet and see lovely embroidery designs which you are certain need adding to your library of designs that you will one day stitch out. However deciding how to use at least a few designs can be quite a challenge, which is why I try to endeavour to give ideas on the use of many of my designs, especially the larger the ones! Take my latest set of designs which complete the Harriet collection. 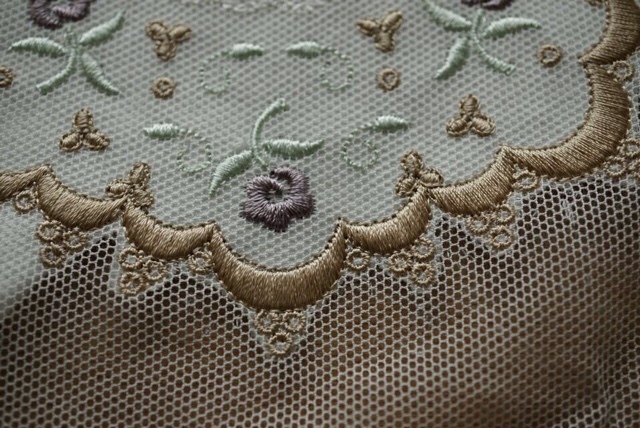 This is an heirloom collection with an emphasis on wing needle embroidery, and was named after one of the characters in Jane Austen’s remarkable book, Emma. Now there are 12 designs in this set for 12″ by 8″ hoops and with this set comes a very detailed PDF which gives you all sorts of information on each design, including the threads used, the size and stitch count. I usually give a little description of the designs indicating what I had in mind when I digitised them. Today I would like to go into greater depth about some of these designs which I hope will give you heaps of inspiration for these or other designs. Take the design shown here which I designed to be a coaster or mat. When testing it out I embroidered it on a layer of cotton with English cotton net on top to see how it would look. I used ordinary needles as I felt the wing needle effect would be lost with the netting on top! I secured these together with temporary adhesive spray. I was pleased with the result but was concerned about how to get a neat edge to the coaster. My thoughts were that the net would soften the edge and allow for a few errors in cutting. 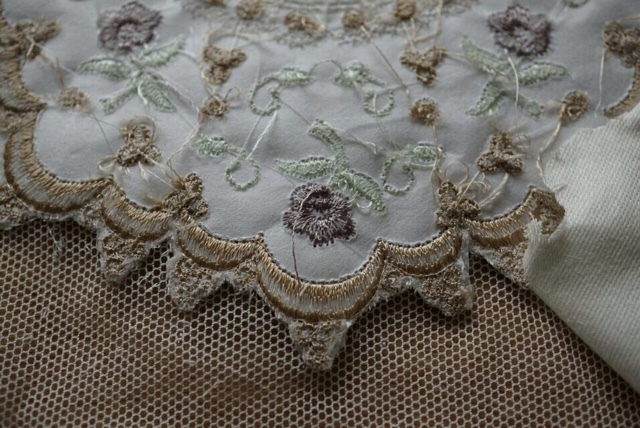 These little rings on the edge of the scallops prevent this from being neatly edged during the embroidery process as can sometimes be done with scalloped edge designs. Before tidying up the back of my work and removing as much stitch and tear as possible, I cut away the cotton leaving the cotton net in place. After all this was the crucial part of finishing the coaster off! I used my little appliqué scissors to do this and was surprised at how easy it was to cut all around without catching the net. The first time I used appliqué scissors I found them awkward and wasn’t sure how to use them but the duck billed blade goes underneath and pushes away the fabric so you do not catch it as you cut. When I had cut all around I could see lots of possibilities for this even wondering if I could insert it into a fabric square or use it for an overlay on a small bag. Now the English net need not be trimmed so close to the scallops. 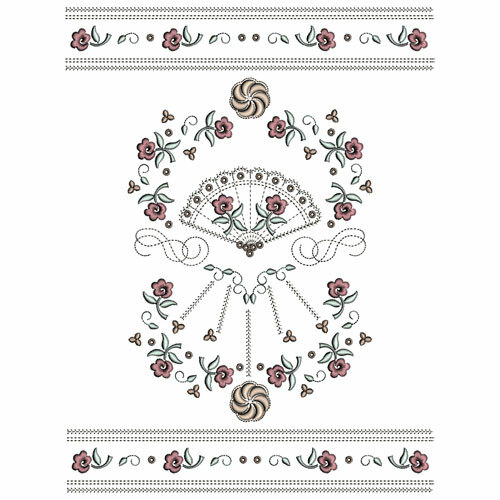 This next design has been created in such a way that you can create an endless border with it. I had in mind embroidering the under skirt of a layered skirt for my grand daughters and in testing the design I experimented with folded cotton fabric that had been serged (overlocked), to avoid hemming which would give a neater look. It was important in doing this that I made sure that the embroidery caught enough of the folded fabric to hold it in place. A different look can be achieved by stitching the design out in just one colour, say Sulky Rayon 40 wt Tawny Tan 1055 which is a lovely pale gold colour. Make sure it co-ordinates with other colours you use in your project. 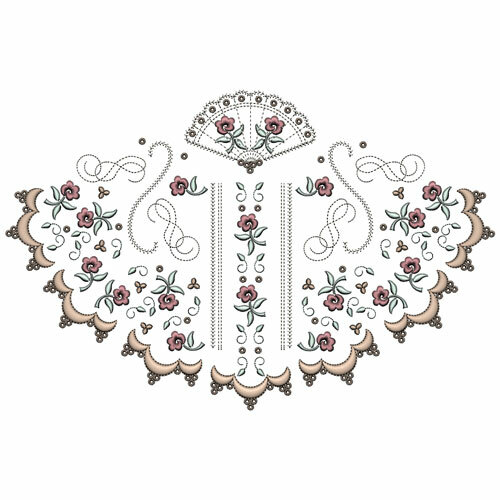 When I digitised this design I wanted to have a scalloped border at the top but I wasn’t sure about the result, so I have kept it in but it can be easily omitted by not stitching out the last colour! As I used to be bridal dressmaker I automatically create bodice type designs. 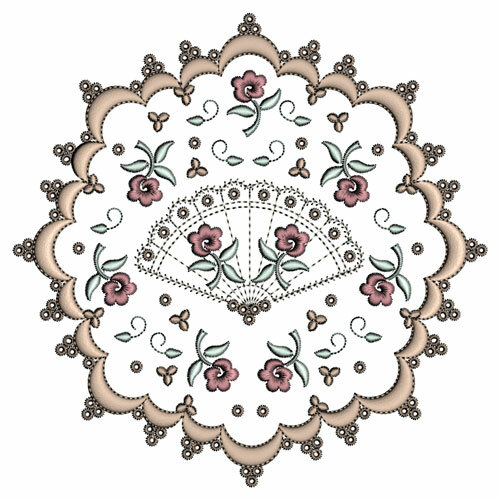 It is amazing that everybody sees different things in an image and it is the same with embroidery designs. 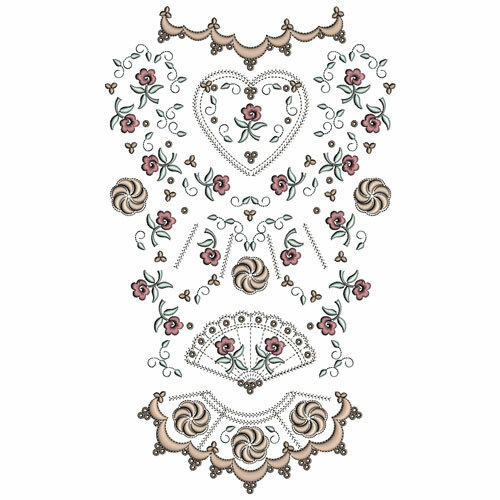 This reminds me of a collar but others may see a lovely design for each end of a table runner! I love godets on skirts and this would look great stitched within several, catching the eye as you turn. It would work perfectly on the back of a jacket making a grand statement especially if you added some crystals. 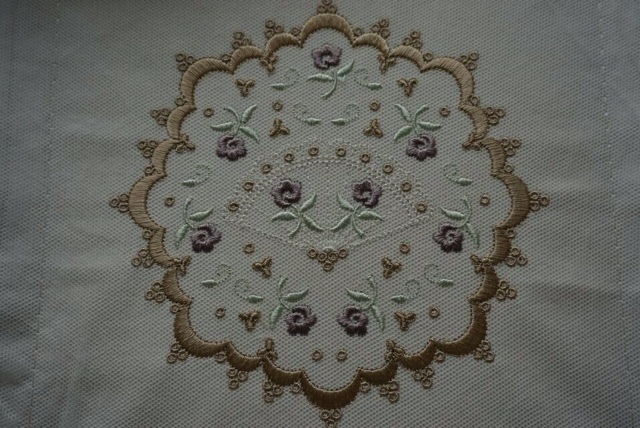 Embroidery is just as stunning on the back of garments as the front of them, and when I am browsing in the shops examining embroidered clothes for ideas I am always incredulous and disappointed that beautiful jackets and dresses have no embroidery on the back!!! Use this unusual shape to determine the shape of a bag. In creating this design I used GFE-HAT-1-8 for the top and bottom borders. My suggestion is that if you combine it with itself or with other smaller designs you omit the wing needle stitches because they do not join very smoothly. You will have to do some editing in your software and stitch out the fan using the stitches of the design. However most embroidery machines have heirloom wing needle stitches included and you will get better results using these! Harriet 4 for 12″ by 8″ hoops will be released on 28th April, 2015. This entry was posted in Discussing machine embroidery, Inspirational, New Designs and tagged machine embroidery. Bookmark the permalink. I always learn so much from you Hazel. I love your designs and these are no exception.